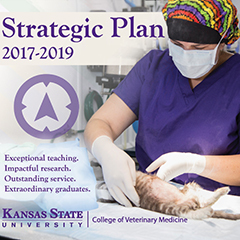 The College of Veterinary Medicine at Kansas State University has unveiled a new strategic plan to guide the college's mission, vision and priorities from 2017 to 2019, to begin immediately. "Our mission is dedicated to the advancement of the health and welfare of animals, people, the environment and the veterinary profession through excellence in teaching, research, service and public service," said Tammy Beckham, dean of the college. "We are committed to a professional degree program with broad training opportunities across a comprehensive range of companion and exotic animals, and livestock species. Our focus is on initiatives that address important societal needs at a local, national and global level. We are looking to build on things we do well and make improvements in areas where we think we can be better." Some of the key actions for implementing the strategic priorities include providing clinical experiences and skills in all years of the Doctor of Veterinary Medicine curriculum; implementing structural changes to the curriculum; identifying steps to reduce the aggregate cost of earning a Doctor of Veterinary Medicine; building on the college's outstanding food animal programs to further realize its excellence in this area; enhancing outreach to veterinary practices, food producers, ranchers, and state and federal agencies; targeting collaborative research opportunities and funding; delivering programs that translate knowledge and discovery to achieve local, national and international impact; creating a new staff council to advocate for all staff in the college; and providing opportunities for professional growth and development for all employees. Through concerted engagement via surveys, strategy focus teams developed a set of strategic recommendations that formed the foundation of this new plan. "Our leadership has now defined a new vision for our college: exceptional teaching, impactful research, outstanding services and extraordinary graduates," Beckham said. "I truly believe we now have a great road map for the next three years." More information is posted online at vet.k-state.edu/strategicplan.